Increasing concentrations of CO2 in the Earth’s atmosphere (IPCC 2007) are causing a gradual warming and acidification of the Earth’s oceans (e.g. Barnett et al. 2005; Caldeira and Wickett 2003; Feely et al. 2004). Both warming and acidification have the potential to affect the distribution and population dynamics of many marine organisms (IPCC 2007; Raven et al. 2005; Fabry et al. 2008). Significant advances in knowledge have been made over the last decade that have advanced understanding of how increasing ocean acidity will impact nearshore and coral reef ecosystems (Fabry et al. 2008). 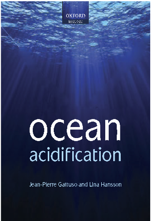 Our understanding about the effects of acidification on pelagic ecosystems, however, remains rudimentary. In the Pacific Ocean, improving our knowledge on the possible impacts on the pelagic environment is important, as the Pacific’s tuna populations are of one of the largest and most valuable fisheries in the world (Williams and Terawasi 2009). The income derived from tuna fisheries provides a significant contribution to the economies of many Pacific Island countries and territories (Gillett 2009). To ensure such economic benefits are maintainedthrough the sustainable management of this fishery requires an understanding of not only fishery impacts, but impacts of other factors upon population biomass and structure over time. While fishery scientists are now attempting to predict how ocean warming will affect Pacific tuna populations (Lehodey et al. 2010, 2013), no one has previously investigated how ocean acidification (OA) may affect these species and associated fisheries. Bromhead D., Scholey V., Margulies D., Nicol S., Wexler J., Santiago M., Hoyle S., Lennert-Cody C., Havenhand J., Williamson J. E., Ilyina T. & Lehodey P., 2014. 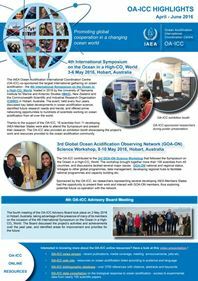 Assessing the impacts of ocean acidification upon tropical tuna. Fisheries Newsletter 142:43-51. Article.